On-site comprehensive inspection with a thorough report and review to focus on the five keys of food safety including controlling time & temperature abuse, preventing cross-contamination, proper cleaning and sanitizing of equipment, only buying food from reputable suppliers and practicing proper personal hygiene. The inspection is based on the current FDA Food Code and will list specific food code violations for each Priority Foundation (previously Critical Violation) and necessary corrective action. We are CP-FS certified (Certified Professional in Food Safety) by NEHA. Discount pricing available when booked in conjunction with ServSafe® group training or add as a monthly service. Email us at info@hrfoodsafe.com for more details or complete the inquiry form below. On-site Plan Review to assist with new foodservice establishments or those in process of construction or renovations. We will work with your board of health to meet the requirements necessary to obtain your foodservice permit. This will include facility design, equipment specifications, menu requirements, as well as your flow of food meeting your local and state requirements. Upon completion of the plan you will submit your documents to your local regulatory agency for review. We will work with you to meet the requirements necessary. We are CP-FS certified and can also assist in insuring the proper staff is Food Protection Manager Certified to meet the requirements of the current food code. Email us at info@hrfoodsafe.com for more details or complete the inquiry form below. Hazard Analysis Critical Control Point plan development and implementation. Fulfills USDA/FSIS and FDA regulatory requirements for HACCP training and the SQF Institute HACCP training requirement for expert practitioners and consultant/auditors. We will work with your team to create a plan that works and aid in the successful implementation. Pricing based on specific regulatory requirements. Email us at info@hrfoodsafe.com for more details or complete the inquiry form below. Our services range from writing of training manuals for your operation to assisting with the on-site training process. Training is the foundation of every successful business. Identifying your team's strengths as well as weaknesses and focus on implementing plans to enhance your training programs is an integral part of our services. 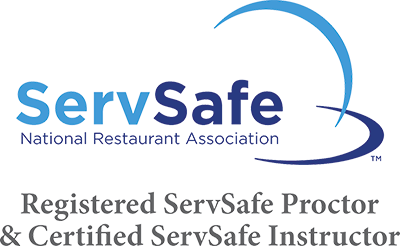 We offer onsite classes for Food Protection Manager Certification, Food Handler, Responsible Alcohol Service, Allergen and Choke Saver/CPR. Email us at info@hrfoodsafe.com or complete the inquiry form below. Email us at info@hrfoodsafe.com or complete the inquiry form below. For more information please complete the inquiry form. You will be contacted shortly after submitting the information to discuss your needs. Thank you for choosing HRFoodSafe!